It's been about a week since our last update on features added to the 5CC board game search so we wanted to give another update with all the major features we've added! We've been excited to get more and more feedback from users so keep it coming! If you have an opinion on what feature or bug should be worked on next tell us now! We respond to every comment and email we get. I'll start by highlighting a couple key new features. This has been a clear feature that the site has needed for a while and it's now been implemented! If a game has expansions for it, you can add the links to the expansions from the base game. There's a new section below the videos area where you can do that by hitting the plus icon. We got a feature request that was absolute genius, so thank you Steffen for the suggestion! It's so simple that it feels silly how it was overlooked. It's the idea that a game can have links to card sleeves, playmats, component upgrades, and any other accessory type product that works with it. We've now got the system for this in place! The way we've implemented it is that any gaming product that would be considered an accessory like card sleeves is entered into the database like normal and on the edit page is categorized as an accessory. Next any game can specify what accessory specifications it meets like card sleeve sizes, or playmat types. Once a game has set up accessory specifications, it will be linked to all matching products! Here's an example of 7 Wonders. Each one of these products is listed as an accessory on the edit page specifying a category of product and then the specific details. Then on the 7 Wonders game, any number of specifications it meets can be added. In this case it has 2 specifications that it matches. 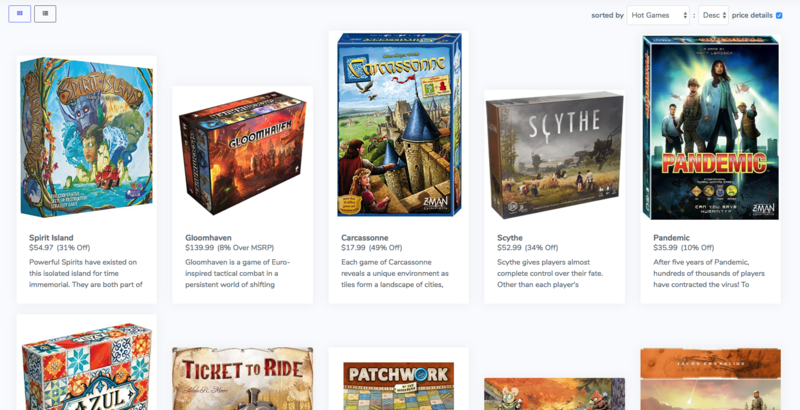 As the database of games and game products continue to grow, if more 7 Wonders playmats or card sleeves get added, the 7 Wonders game page will automatically connect the products! Currently we only have a few products properly linked up but we're continuing to see games and gaming products every day added to the system by users like you! It's a wiki style database so feel free to add games and gaming products as you wish! Speaking of games getting added, in the last 7 days we've had over 5000 games added to our database by users! Thank you so much for the growing interest in this project. We're stoked to have so many great contributions and will continue to support it with new features and more tools to help! We've created a new order that the games can be displayed in called the Hot Games list. The list order is based on what games were mentioned in bold on /r/boardgames comments. It counts the number of mention a game gets over the last 7 days and orders it based off that number. It's updated every day so the list continues to change and show the trends of conversations! Issue with the 'Owned' list showing twice on the game results page. The feature list and bug fixes list here have been heavily influenced by the feedback we've gotten from reaching out to about 150 users now. We are hungry for feedback and want to see this not only thrive but become something spectacular for the board game community! Feel free to comment with any feedback, requests, or issues or send an email to mailto:contact@5colorcombo.com.